Here’s another set of photographs from the Macduffs, taken in the 1950s (before they left Malaya). This one shows the boys’ handicap race; Ian is said to be the boy standing 3rd from the left, while Ian and Sheila’s father – Ken Macduff – is the official in the far right (the one with the unique hairstyle). 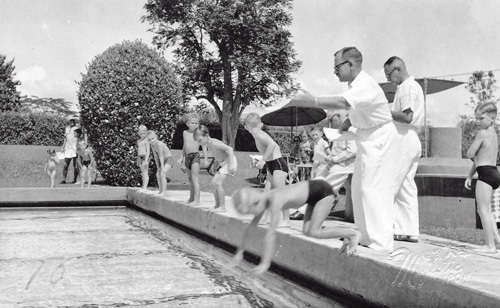 The picture on the left shows the children standing in line, waiting to use the diving board. The picture on the right is probably the Macduff family. In the photo of the 4 girls, the only Macduff there is Sheila, and she’s the one on the left of the photo. I’ll get you an update, if I can, of the others. I think the tall girl was called Dawn. In the photo of the kids on – or waiting for – the diving board, I think there Service twins might be featured. Gavin should be able to confirm that. In the photo at the top, the young boy on the far right is I think Colin Medleycott who was a brilliant swimmer and diver. He has a brother Rex who has left comments and information on other sites with regard to Ipoh. What memories these pictures invoke of our golden childhood in Paradise! All childhoods should feel like Paradise, but I suspect that many don’t. Does anyone remember The 7th Mile Club at Batu Gajah ? is it still going? if not when did it close? anyone have any memories of the place?